This article outlines how to use the global search within the CRM. There is a lot of information which can be stored within the CRM and it is important to know how to search and locate it. 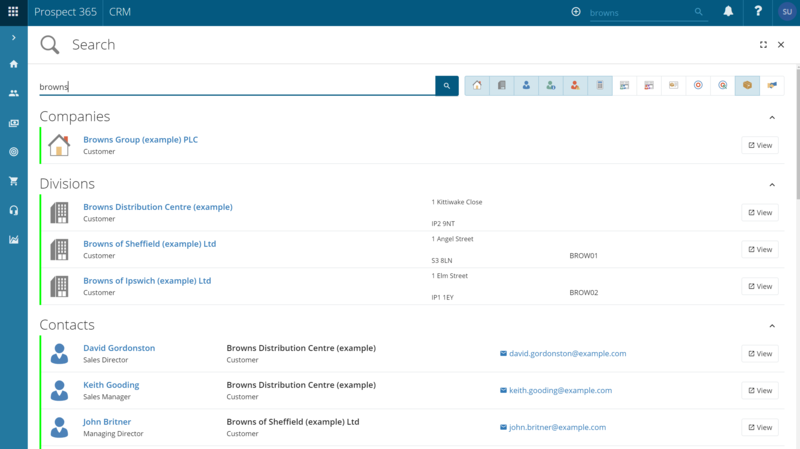 The Global Search allows you to search through all levels of the hierarchy from Company through to Product Items, in the same search window. In the example below we have searched for ‘Browns’ using the Global Search located in the top right-hand corner. Using this search term, the search has returned relevant results for all levels of the hierarchy. Any of those records containing the text ‘Browns’ will be displayed. This includes any Problems or Leads which have been created under a record with the text ‘Browns’ in. It will also include any records which are a child of a record with ‘Browns’ in. Clicking on the Name of the record or ‘View’ will open up the record. The search results also include some brief information about each of the records, for example for division records it states the Sales Ledger. To help narrow down your search you can select which records you need to be displayed in the search results. This is done by selecting from the icons located at the top of the search. Within the search results you can also expand the different record types by clicking 'Show More'. For more information about searches in the CRM please see our video below.